Mo Farah was questioned by the US Anti-Doping Agency on Saturday as part of an investigation into claims the Olympic champion's coach Alberto Salazar breached anti-doping rules. Briton Farah, who won the 3,000m at the Anniversary Games at the Olympic Stadium on Friday, was interviewed for five hours by Usada lawyer Bill Bock. There is no suggestion the double Olympic champion is under investigation, he has always denied any wrongdoing - as has Salazar - and he still works with the American. Running in England for the first time since the allegations against Salazar were made, Farah clocked the fastest time in the world this year, winning in seven minutes 34.66 seconds. After receiving a raucous reception from the crowd in London, he told BBC Sport: "The crowd have been amazing, as has the support I have got for the last few months." Both UK Anti-Doping and Usada are investigating claims made in the BBC Panorama programme Catch Me If You Can. The programme alleged Salazar violated various anti-doping rules and used testosterone medication on Galen Rupp in 2002, when the US athlete was 16. Rupp also denies all the claims. 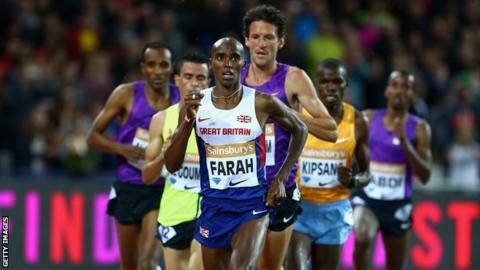 Farah, who won the 5,000m and 10,000m at London 2012, will spend the next month training for the World Championships in Beijing in August. He has said he is ready for the "heavy" training needed to convert his good recent form into a successful defence of his 5,000m and 10,000m world titles in China.